The UNICEF and UNFPA Evaluation Offices plan to jointly commission an evaluability assessment of the UNFPA-UNICEF Global Programme to Accelerate Action to End Child Marriage. An evaluability assessment is an exercise to determine the overall readiness of the programme to be evaluated in a reliable and credible fashion and check the coherence and logic of the programme. The initial phase of the UNFPA-UNICEF Global Programme is spanning from 1 January 2016 to 31 December 2019, with an indicative four-year budget (2016-2019) estimated at $246.7 million with contributions from Canada, the Netherlands, Italy, the United Kingdom and the European Commission. The application should be sent to evalofficeapplications@unicef.org , no later than close of business on 17 February 2017. Developing national evaluation capacities in the sustainable development era: four key challenges, the fifth publication of the IIED-EVALSDGs briefing series has been released. Click here to view. You can view all briefings on the IIED website at http://www.iied.org/effective-evaluation-for-sustainable-development-goals. For 70 years, the United Nations Children's Fund (UNICEF) has been working on the ground in 190 countries and territories to promote children's survival, protection and development. The world's largest provider of vaccines for developing countries, UNICEF supports child health and nutrition, good water and sanitation, quality basic education for all boys and girls, and the protection of children from violence, exploitation, and AIDS. UNICEF is funded entirely by the voluntary contributions of individuals, businesses, foundations and governments. The incumbent of the post will lead UNICEF Ghana's M&E unit and work with the UN country team to support UNCT goals for delivering valid and reliable information on the attainment of the MDGs and other goals, and on the performance of UN-supported programmes. The incumbent of the post will also assist with the establishment of monitoring and evaluation tools which enhance partnership between the UNCT, government and other key players to collectively track progress on MDGs and other international commitment for children. The incumbent will also assist with the development of national capacities for monitoring, evaluation and research, with special attention to the interest, concern and participation of government, community, and civil society stakeholders. Click here to visit the UNICEF Job website for more information. Caribbean Evaluators International has released their Winter 2016 newsletter. What is the Purpose of Monitoring our Plans in Government? The Office of the High Commissioner for Human Rights is looking for two external consultants to conduct the evaluation of OHCHR's Support to Legislation in Conformity with International Standards. The evaluation will be undertaken between February and August 2017 and missions to OHCHR Headquarters and field locations for documentary review and interviews with stakeholders are envisaged. - Advanced university degree (Master’s degree or equivalent) in law, political science, international relations, social science, economics, management, or related field. A first level university degree in combination with a qualifying experience may be accepted in lieu of the advanced university degree. - Minimum of 12 years of experience conducting evaluations of projects, programs or policies in the UN or international context. - Experience conducting evaluations in human rights or related field (humanitarian assistance, peace operations, emergency or post-conflict situations). - Fluency in oral and written English. - Knowledge of legislation in compliance with international human rights standards, particularly on non-discrimination and rule of law issues, is desirable. - Knowledge of OHCHR is desirable. - Knowledge of French and/or Spanish is desirable. - Minimum of 12 years of experience on legislation in compliance with international human rights standards. - Experience on non-discrimination and rule of law issues. - Experience conducting evaluations in human rights or related field (humanitarian assistance, peace operations, emergency or post conflict situations) is desirable. If you are interested in conducting this evaluation, please register in https://inspira.un.org and send us your updated CV and UN P-11 form to smonroy@ohchr.org by Monday 2nd of January 2017. UNICEF is seeking Expressions of Interest (EOIs) from institutions for the provision of services to conduct an independent Outcome Evaluation of the Capacity Development Partnership Fund (CDPF) Phase II. The evaluation is scheduled for implementation from July to December 2017. It is foreseen that the evaluation will be carried out by a team of four consultants with strong background in evaluation and relevant subject matter expertise. Interested institutions are encouraged to complete the EOI form in attachment and available at: https://www.unicef.org/cambodia/overview_17867.html or https://www.ungm.org/Public/Notice/52226. EOIs should be sent to ksok@unicef.org, no later than 5:00 pm (Phnom Penh, Cambodia) on 30 December, 2016. Please quote “Outcome Evaluation CDPF Phase II” as the subject in your correspondence. Kindly note that this EOI does not constitute a solicitation. We do not require bids or proposals at this stage; we merely seek your expression of interest in participating in the tender. If you have any additional questions about this EOI, please email Ms. Sok Keang (ksok@unicef.org). Emails only, please; calls will not be returned. UNICEF Evaluation Office (New York) plans to contract with an experienced early childhood evaluation consultant to conduct a formative evaluation on UNICEF’s approach to supporting inclusive and equitable play and development opportunities for children ages 3 to 5 through the use of the Early Childhood Development Kit. The evaluation will be conducted in Uganda from December 2016 - December 2017, where the UNICEF Country Office is currently using the ECD kits within a humanitarian programming context. Experience in applying qualitative and quantitative evaluation methods, with a minimum of seven years of professional experience for the lead expert (a minimum of five years’ experience for the other team members) in programme and policy evaluation demonstrating a strong record in designing, conducting and leading evaluations. At least some of this experience will be in the science area. The evaluation will be conducted between December 2016 and April 2017 and is estimated to take up 50-65 working days. Click here to visit the UNGM website for more information. As we build towards The Breaking Barriers in Participation and Inclusion in Peacebuilding Evaluation Conference in South Africa, join DME for Peace tomorrow Thursday, November 17th at 10:00am EST as Mark Abrahams, Founding Member of the South African Monitoring & Evaluation Association and Editor-in-Chief of the African Evaluation Journal, hosts the M&E Thursday Talk series to lead a discussion on "The roles and function of VOPEs in promoting democratic practices and accountability: The case of SAMEA." This discussion will focus on the South African Monitoring and Evaluation Association (SAMEA) as a Volunteer Organization for Professional Evaluation and reflects briefly on its creation, the steady growth over the years and the significant challenges it faced both internally and externally. As a function of deepening and strengthening democracy, transparency and ensuring that it remains relevant, SAMEA must also attend to the existing gaps in the evaluation skills set(s) or competencies of its members. What is often under-represented in formal accredited courses, short courses and a significant number of M&E professional development initiatives - is the focus on the interpersonal domain that addresses human relations and social interactions that ground evaluator effectiveness. We hope that you will be able to join us for a riveting discussion! Click here to view the United Nations Global Marketplace (UNGM) page for this RFP. Expected duration: 30 working days (between 15 December 2016 and 31 March 2017) with field work during Jan 22 January to Feb 2 2016. Road to Jobs: Bringing decent work to rural households of the Northern Provinces in Afghanistan Project. The Project is funded by SIDA-UNOPS and is implemented by ILO Kabul. This three year Project started its implementation starting mid-2015 and will end in mid-2018. Road to Jobs (R2J) project aims at these constraints more systematically to get at the ‘root causes’ for the underperformance of selected value chain sectors, and in doing so to encourage local ownership of change and sustainable impact. The deadline to submit expressions of interest for the evaluation is by close of business on 30 November 2016 sent by e-mail with the subject header “Evaluation of Road to Jobs (R2J) Project” to the Evaluation Manager, Khadija Khondker at khondker@ilo.org and copied to Ms Pamornrat Pringsulaka, pamornrat@ilo.org. Key message 6 from the study addresses an important fact: No development organization operates in isolation. Whether it be government counterparts, partner UN agencies or national development stakeholders, there is a broad audience for evaluation products, their findings and their recommendations. It is in this spirit that in 1994 the Independent Office of Evaluation of IFAD launched the practice of hosting a national workshop learning event as a final step in the country programme evaluation process, bringing together participants from the national government, national development organizations and IFAD. The objective of this webinar is to share with participants a look into the practice of hosting this national learning events and the impact that such events and related evaluation products have beyond the publication of an evaluation report and stimulate the exchange of experiences of UN evaluators regarding cross-organizational learning and sharing. The webinar will start with a presentation, followed by a Q&A session. The special guests will include an IFAD out-posted Country Programme Manager and a Country Programme Officer. Please feel free to forward the invitation to colleagues who are interested in the subject. Hope you will be able to attend! · If prompted, download drivers for WebEx. UNICEF promotes the rights and wellbeing of every child, in everything we do. Together with our partners, we work in 190 countries and territories to translate that commitment into practical action, focusing special effort on reaching the most vulnerable and excluded children everywhere. UNICEF is funded entirely by voluntary contributions of individuals, businesses, foundations and governments. The Director of the Evaluation Office enables organizational learning, accountability and performance improvement by spearheading intellectual and organizational leadership and strategic guidance for UNICEF. The Director leads and manages the staff of the Evaluation Office and is accountable for the performance of the Office. The Director sets the vision for the effective governance of the evaluation function and leads on all aspects of evaluation policy and practice, in particular the establishment of guiding norms and principles; the maintenance of topical or thematic coverage; the proper application of technical methods and quality assurance processes; and the definition of roles and responsibilities including standard operating procedures. The Director leads the development of the evaluation function; facilitates its resourcing; and manages evaluation partnerships with key networks and organizations. The Director will also manage inter-agency collaboration and other evaluation partnerships. The Director is also an advocate for the uptake and use of evaluation results. Setting the vision for evaluation in UNICEF: maintaining a comprehensive quality assurance system; setting and monitoring performance standards for evaluation. Leading the delivery of a programme of independent evaluations: laying out strategic priorities and identifying major global thematic evaluations. Representing UNICEF in evaluation partnerships with key networks and organizations. Managing systems for effective management of evaluation evidence, information and knowledge. Leading development and professionalization of the UNICEF evaluation function: developing innovative approaches and methodologies; arranging guidance and support to offices in designing and staffing the function, and to staff in long-term career development. Management of people and resources: providing leadership and direction by effectively managing all resources; motivating, coaching and supporting staff to create a unified culture to reach common goals; developing workforce planning, recruitment, performance management, learning and career management of staff. Advanced university degree in a social science or international development subject such as development planning, economics, law, business and public administration, statistics, political science or any other related field. At least 15 years in progressively responsible professional work related to monitoring / evaluation / research and management in diverse field and headquarters organizational levels; with at least half of that experience obtained in developing nations and multicultural settings. At least 15 years of experience in international development and humanitarian institutions and contexts. At least 10 years senior level management experience in Evaluation or in a closely related function at either a very large country office, or in regional / headquarters locations. Experience within United Nations Organizations is strongly preferred. Understanding of and, preferably, familiarity with the technical areas in international development and humanitarian action relevant to UNICEF's mandate. State of the art knowledge of evaluation principles and methods. Results-oriented leader with a track record in strategic and global thinking, fostering innovation and, engaging and managing risk. Strong management and leadership skills, track record in empowering people to achieve results. Strong communication skills with the capacity to succinctly convey ideas and advocate for organisational positions. Fluency in English is required. Knowledge of another UN language (Arabic, Chinese, French, Russian, and Spanish) is strongly desirable. Knowledge of a third language is also preferred. 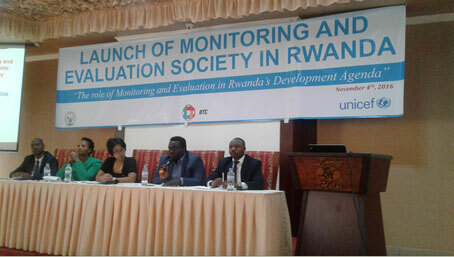 Rwanda Monitoring and Evaluation Society is Born! 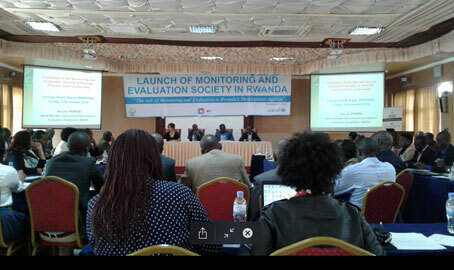 4 November 2016, goes down in the History of the Evaluation Profession in Rwanda as the day that gave birth to the Rwanda Monitoring and Evaluation Society. I am happy to have witnessed this great milestone in Africa’s Evaluation History as it unfolded at the Lemigo Hotel in Kigali, Rwanda. The process that finally culminated into the official launch of the Society traces its origins to the International Programme for Development Evaluation Training (IPDET) through the inspiration of Dr. Linda Morra-Imas and Dr. Ray Rist. These two Evaluation greats conducted a mini-IPDET to a cross-section of Evaluation professionals in Rwanda a few years back. In June 2015, a Rwanda Evaluation professional, Mr. Alex Mugabo Kashaija, presently working as the Regional Coordinator for Heifer International in Rwanda, attended the IPDET Training at Carleton University in Ottawa, Canada. Inspired by this training, he came back home and compared notes with another IPDET Alumni, Ms. Judith Kaitesi Katabarwa, presently working with the National Capacity Building Secretariat (NCBS) of Rwanda as the Division Manager for Strategic Operations and Quality Assurance. Together they hatched the idea of coming up with a Monitoring and Evaluation Society for Rwanda. They teamed up with an IDEAS Board member, Mr. Awuor Ponge, who in January 2016, briefed the Evaluaton Professionals on the modalities of coming up with such a society. This joint effort climaxed with the official launch of the Society in Rwanda, which was witnessed by all the key stakeholders in Rwanda at the High Level event. More than 90 High Profile Evaluation practitioners, Evaluation Commissioners and Evaluation Users graced this occasion. The occasion was catalysed by a High Profile Panel Session moderated by Mr. Ponge and addressed by Senior Officers in Rwanda, including: Mr. Dominique Habimana, the Director of Statistical Methods, Research and Publication at the National Institute of Statistics of Rwanda (NISR); Mr. Godfrey Kabera, the Director General in-charge of National Development Planning and Research in the Ministry of Finance and Economic Planning in Rwanda; Ms. Yumi Matsuda, the UNICEF Chief of Planning, Monitoring and Evaluation in Rwanda; Ms. Judith Kaitesi Katabarwa, the Division Manager for Strategic Operations and Quality Assurance at the National Capacity Building Secretariat (NCBS); and last but not least, Dr. Alfred R. Bizoza, the Director of Research at the Institute of Policy Analysis and Research (IPAR-Rwanda). The Panel Session addressed the role of Evaluation in the Development Agenda of Rwanda, how Rwanda is positioned to the implementation of its National Blueprint, the Vision 2020 as well as the global development blueprint, the SDGs. It also addressed how the International Community is positioned to work hand-in-hand with the Government of Rwanda and other key stakeholders to ensure that evaluation helps in establishing evidence that informs development interventions and policy in Rwanda. Lastly, the Panel discussed what the role of the Society for Professional Evaluators would be in the development arena in Rwanda. This Society is supported by the Government of Rwanda, through the National Capacity Building Secretariat (NCBS), which has been so instrumental in the mobilisation of the key stakeholders in Rwanda. This event was jointly sponsored by the Government of the Republic of Rwanda, the United Nations through UNICEF Rwanda Country Office; and the Belgian Technical Cooperation agency (BTC). Ladies and Gentlemen, please join me in congratulating the Evaluation fraternity in Rwanda for this great milestone. We welcome the new Evaluation Society in the global community of evaluation practitioners. Lead and provide guidance to ensure economic soundness of private sector operations. Assist in providing quality assurance with respect to the identification, measuring and monitoring of development effectiveness of Private Sector Operations Department (PSOD) transactions. Provide support to PSOD project divisions in economic evaluation of projects. Represents PSOD, as appropriate, in consultations with other departments and with other multilateral development banks (MDBs) on development effectiveness. Work within general policies, principles and goals, working directly with clients. Master's Degree, or equivalent, in Economics. University degree in Economics combined with specialized experience in similar organization/s, may be considered in lieu of a Master’s degree. International experience working in development in several countries, preferably in Asia and the Pacific region. UNICEF’s Evaluation Office (EO) is seeking Expressions of Interest (EOI) from qualified institutions (consultancy firms, universities, etc.) for the provision of services to complete an independent global thematic evaluation of UNICEF’s strategies and programme performance with regard to strengthening child protection systems. How can communications improve engagement with evaluation users, and eventually increase evaluation use? How can evaluators improve communications to increase evaluation use? You are cordially invited to attend a UNEG webinar on “Communications and Evaluation Use”. This webinar is organized by UNEG working groups under Strategic Objective Two for Use of Evaluation. When: Tuesday, 8 November, from 9:30 to 10:30 am (New York time). How to join: Please click to join the webinar in due course. You will also find dial-in options there by clicking "more information". WFP Office of Evaluation is seeking evaluation consultants in order to expand its pool of evaluation professionals from around the world and increase the level and quality of services provided to decentralized evaluations. In order to commission independent evaluations, WFP Office of Evaluation hires either firms or individuals. This vacancy helps to identify individuals. Therefore, candidates who apply to this roster, must not be affiliated to a firm or organization. Successful applicants will remain in the roster for 12 months, and can be considered for individual consultancy contracts as Junior Evaluators, Evaluators, Intermediate Evaluators, Senior Evaluators or Team Leaders in Country Offices or Regional Bureaux. How to apply: Interest candidates should submit CV and apply to the vacancy published here. Please submit all of the information required by November 30th 2016. The vacancy will be open for one month. For details on this assignment, please refer to the above link. The UN Department of Public Information is looking for a consultant with broadcast experience for a short-term assignment. The deadline for expressions of interest has been extended to 4 November 2016. 2. A list of previous evaluations that are relevant to the context and subject matter of this assignment. 3. A copy of the candidate’s curriculum vitae. 4. The names of two referees who are able to be contacted. Please send expressions of interest via email to waruru@un.org by 4 November 2016. Donna Mertens and Transformative Mixed Methods: More justice-oriented methods are needed! In 2016, Donna Mertens, well-known for mixed methods in research and diverse participatory and inclusive approaches to evaluation, conducted a course on Transformative Evaluation for professionals from Chile, Bolivia, Mexico, Colombia, Argentina, and Paraguay in Santiago, Chile. Fabiola Amariles shares what she learned in her blog- Donna Mertens and Transformative Mixed Methods: More justice-oriented methods are needed! Back by popular demand, AEA is bringing Evaluation 2016 to your computer or electronic device. With more than 800 participants in 2015, the virtual component of Evaluation 2016 allows evaluators who are unable to join us in Atlanta to experience the education and networking opportunities of the live event. Registration is free and provides you access to more than 20 Evaluation 2016 sessions, including Presidential Strand presentations and all plenary presentations focused on Evaluation + Design. The Virtual Conference provides evaluators who are unable to travel to Atlanta, Georgia, with access to valuable AEA education. This audience includes international evaluators, team members who are unable to attend the live conference, students looking to learn more about evaluation, or other evaluation professionals that can’t participate in Atlanta. To participate in the Evaluation 2016 Virtual Conference, visit the virtual conference website and create an account. This account will be separate from your AEA account. Once your account is created you will receive a confirmation email which grants you access to the virtual conference. c.Leading, training and motivating international/national experts in the conduct of project evaluation. For more information, please see the vacancy announcement. For more information, please see the vacancy announcement on the IFAD website. The current Government of Bangladesh and the United Nations Development Assistance Framework (UNDAF) from 2012 to 2016 is striving to reduce inequity gaps and increase access to basic services for deprived populations in the 20 districts at the bottom of the social deprivation ladder. Communication for Development (C4D) is a major cross-cutting strategy for both the UNDAF and of the UNICEF country programme for the period 2012-2016. The UNICEF C4D programme intends to engage communities to understand people, their beliefs and values, and the social norms that shape their lives. Through sharing of knowledge, understanding and addressing the barriers and constraints across all levels of the community, individuals and communities are informed and empowered to develop or change behaviours and take actions to improve their lives. The goal of the C4D programme is thus to increase knowledge and create awareness among communities, to change individual beliefs and perceptions, influence attitudes and behaviours, and consequently social norms and social practices. Through emphasis on amplifying the voices of the most marginalised and vulnerable, C4D aims to make a positive difference in the lives of children, their families and communities in achieving Millennium Development Goals (MDGs) with equity. The planned C4D outcome in the current UNICEF Country Programme 2012-2016 states that “By end of 2016, deprived community members in 20 selected districts practice key life-saving, care and protective behaviours, raise their demand for quality social services and promote social change with equity”. Call for contributions for Evaluation Matters - "The Problem with Development Evaluation, and what to do about it"
We are currently accepting submissions for the 4th quarter edition 2016 of eVALUAtion Matters, which will focus on “The Problem with Development Evaluation, and what to do about it”. We look forward to receiving your submission. This edition will examine the intractable issues that evaluators, and users of evaluations, struggle with and how these issues can be addressed. Based on your experience either as an evaluator trying to assess the cause-and-effect relationships between development interventions and their outcomes; or a user of evaluations, expecting an evaluation to tell you whether an intervention achieved its objectives, whether the intended outcomes were realized and why (or why not), what are some of the intractable issues that you struggle with? How can these issues be addressed? Transformation requires a change in mindset that must draw on what works, what does not work—and why—to succeed. AfDB Development Evaluation Week 2016 aims to help drive Africa’s transformation by convening development practitioners to share evidence-based knowledge about what works and why, in a bid to inform the way forward towards achievement of the UN Sustainable Development Goals. The learning event aims specifically to foster sharing of evidence-based knowledge related to the five core areas (the “High 5s”)1 the AfDB has chosen to focus on during the next five years. Discussions are expected to inform implementation and evaluation of the “High 5’s”, which are complex by virtue of their nature and African context. La réussite de tout processus de transformation nécessite un changement des mentalités qui doit s’inspirer des succès et des échecs, tout en exposant les raisons. La Semaine de l’évaluation de la BAD 2016 entend contribuer à stimuler la transformation de l’Afrique en réunissant des praticiens du développement pour partager des connaissances factuelles sur les leçons tirées de l’expérience, ce qui permettra de mieux orienter la réalisation des objectifs de développement durable des Nations Unies. L’événement, qui est un forum de réflexion, vise à encourager le partage des connaissances factuelles relatives aux cinq grandes priorités (le « Top 5 ») sur lesquelles la BAD a choisi de se concentrer pour les cinq années à venir. Les discussions sont censées guider la mise en oeuvre et l’évaluation du « Top 5 »1 qui sont complexes, de par leur nature, et au regard du contexte africain. The Office of the United Nations High Commissioner for Refugees (UNHCR}, Global Service Center in Budapest, Hungary, invites qualified service providers to make a firm offer for the establishment of a service contract for the provision of Evaluation of UNHCR's Country Programme in Ukraine. Closing date: 03/10/2016 - 23:59 CET. Click here to view the full RFP document (PDF). Bids should be sent ONLY to the dedicated bid mailbox hqsmsbid@unhcr.org. Please do NOT address or copy your offer to other UNHCR email addresses or individuals. Offers that are addressed to the other email addresses will be marked invalid and will not be considered for evaluation. Please read carefully and respect the manner of submission and the deadlines indicated in the RFP/2016/795. If you have any questions, please send them only to Zoe Varkonyi: varkonyi@unhcr.org on or before 16 September 2016 23:59 hrs CET, as indicated in the RFP. UNICEF’s Lebanon Country Office is looking for evaluation teams to conduct three evaluations in the areas of education, WASH and cash transfers. All information can be found in the links to the RFPS below. The deadline to apply is September 22, 2016.